illus. by Lucy Ruth Cummins. 48p. Chronicle. Feb. 2018. Tr $14.99. ISBN 9781452153742. Gr 1–3—A little boy in a yellow shirt and glasses likes a girl in his grade school class. He brings her things like gumball machine jewelry that matches her shoelaces and his lucky rock. None of these gestures, among others, are valentines, he insists. After all, he likes this girl not just one day, but all the days. 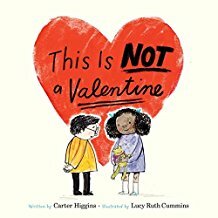 Almost every other page has the text and title of the book, "this is not a valentine," with not underlined. This proclamation is followed by a signal of everyday affection from the boy to the girl. Multimedia illustrations that mimic childlike drawings made with crayons and makers reinforce the grade school setting. As a children's picture book, the tender message of everyday acts of affection, as opposed to grand and less frequent gestures, is quite intellectual. Therefore, this book would make a good book for discussion with older children after it has been shared. VERDICT This enduring message of friendship should give this title a longer and broader shelf life than just another Valentine's Day book.